One year ago we introduced you to a woman named Micheline. A woman with a dream to change her community. To bring light into the darkness. To name value and worth. To teach and to mentor. Over the past year, a handful of young women have completed their training in the One Thread program. They've witnessed a light in the darkness. They've been told they are valuable and loved. They have learned and grown. They've found hope. Now, they are ready to transition onto an atelier, a workshop where they will continue to perfect their skills and create garments to be sold. In this new setting they will also start earning an income to become financially independent through their work. We are partnering with Micheline and her soon-to-be graduates to create an atelier and boutique. A marketplace where clients and customers can come to order and purchase garments. A place where the women will continue to work under the watchful and motherly eye of Micheline. A place where Ismael, our invaluable social worker, will be able to keep up with them and help us know how to best care for their needs. The move toward independence and sustainability is delicate, we want to make sure these women and their children continue to be nurtured and cared for on their journeys. Your purchase of these tees and tanks will help raise the funds needed to set up shop. 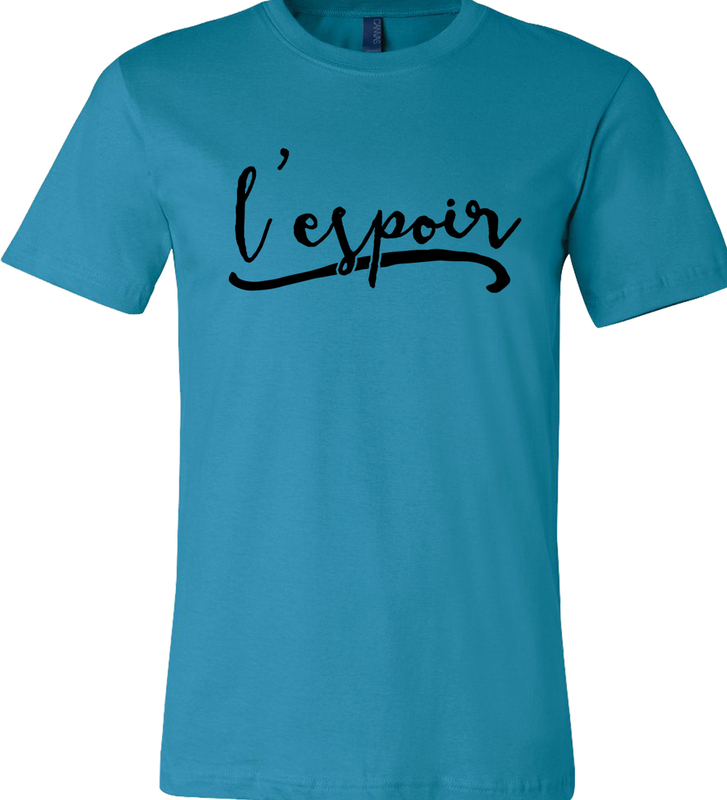 L'espoir means hope. Your purchase will go directly to helping us bring Phase II of Hope to these young women! VISIT OUR SHOP TO PLACE YOUR PRE-ORDER NOW!